1. What is M1 ID? M1 ID is an email address of your choice to allow you to remember it easily. It also allows you to login once, and manage all your services under M1. 2. Why should I sign up for M1 ID? 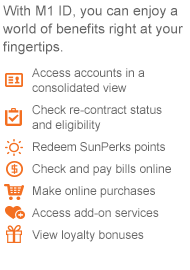 View & Pay your bill, update billing address and personal particulars, check and renew your service contract, and subscribe to or change your value-added services. Reward yourself with treats from our SunPerks catalogue. Get yourself a latest smart phone or sign up Fibre Broadband Service without leaving the comfort of your house. 3. How do I sign up for M1 ID? b. Click 'REGISTER NOW' and fill out the required information. c. Once M1 ID is created, click on the URL within the email sent to your M1 ID email address to activate it. You will not be able to use the M1 ID unless it is activated. d. In the event you do not receive the activation email in your inbox, please check your Junk/Spam folder. e. If the M1 ID is not activated within 2 days of creation, it will be removed from our system and a new M1 ID will need to be created. 4. Can I sign up for more than one M1 ID? You can only sign up for one M1 ID under each NRIC/FIN. 5. If I am not an M1 customer, can I sign up for M1 ID? Yes, you may sign up for M1 ID to access our e-Commerce portal. 6. I have an existing Service ID (Mobile Number or Home Broadband User-ID). Can I continue to use it to log in to Manage My Account (MMA) and M1 Rewards redemption? Yes, customers with active M1 services can continue to use existing Service ID to access services such as Connecting Tone, M1 Music and Entertainment Service and some functions in MMA such as Activate services for your existing service number, pay bill, etc. However, access to M1 SunPerks Rewards redemption, M1 e-Commerce Portal, and certain functions within MMA such as Change Address and View Bill will require M1 ID. 7. What is the difference between M1 ID and the existing service ID (Mobile Number or Home Broadband User ID)? 8. What will happen to my M1 ID if I terminate all my M1 services? Your M1 ID will remain active and allow you to access M1 e-Commerce Portal. 9. Can I change the email address used for my M1 ID? Yes, you can do so by clicking on the 'Edit your M1 ID' link found within the Account Summary page after you have logged in. 10. I encountered problem when registering for an M1 ID, what should I do? ii. Check that the email address entered/chosen NRIC/FIN have not been used to register for M1 ID yet by using 'Forgot M1 ID' function. iii. On 'M1 Login - Forgot M1 ID' page, enter your NRIC / FIN Number as registered for your M1 services. If your attempts are still unsuccessful, please contact our Customer Service at 1627. 11. I encountered problem when I tried to login with my mobile number, User ID or M1 ID, what should I do? 12. I have forgotten my M1 ID and/or password, what should I do? iii. Select "Forgot M1 ID?" iv. Fill in all required information and click "Submit"
vi. Fill in all required information and click "Submit"
13. I want to reset my password, what should I do?